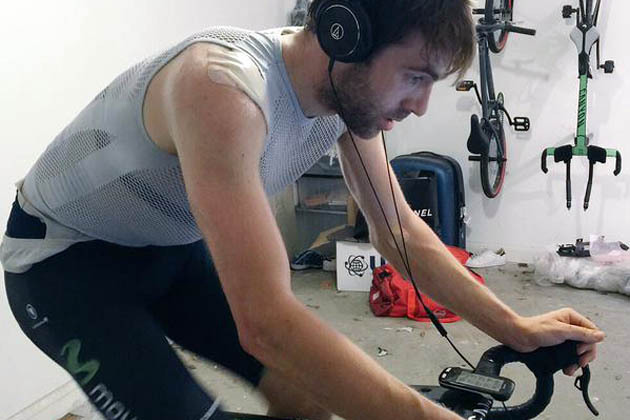 Alex Dowsett is hoping to make his attempt at the UCI Hour Record in late April after his initial plans were postponed by a training crash that resulted in a broken collarbone. The 26 year-old’s support team are looking at the slot to minimise the disruption to the Movistar rider’s road season and ahead of Bradley Wiggins’ attempt scheduled to take place in London on June 7. “Everyone is trying their hardest and we’re fairly confident we can pull it together,” Dowsett told Cycling Weekly. “Once you get good form, it’s easy to keep it ticking over and I tried to do that as best I could during the collarbone break. “I had a two hour track session last week and during the last hour I was hitting some decent numbers again and starting to feel my normal self, so it would be a shame not to do the attempt in April,” he added. Dowsett had been down to attempt the Hour on February 27 at the London round of the Revolution but broke his collarbone in a crash after he had been out training with fellow Essex resident Mark Cavendish. The Commonwealth Games time trial champion and current record holder over 10 miles will have to contend with the mark currently held by Rohan Dennis (BMC) of 52.491km. He explained that the recent failures of Jack Bobridge (January 31), Thomas Dekker (February 25) and Sarah Storey (February 28) had not changed his appreciation of the task facing him. It’s all about the pacing. “With all due respect to Bobridge, he showed us what happens if you go out too hard,” Dowsett said. “Obviously Rohan and Matthias [Brändle] paced their attempts as well as anyone is going to. Besides the spanner thrown in the works by Gustav Larsson, a former runner up in the 2008 Olympic Games and 2009 world championships time trial who on Tuesday officially announced he would make an Hour Record bid this Saturday, March 14, the enforced postponement at least gives Dowsett a good idea of the mark he has to beat. “I wouldn’t have wished the collarbone break on myself but before, Rohan and [Jack] Bobridge would have gone and I would have only known my target for a fortnight before I raced, so it would have been difficult to train. Laps of 17.1 seconds would give Dowsett a distance of 52.632km, less than a lap more than Dennis’s total. “We just know that’s what we need to do to beat the record so that’s what we can train for effectively,” he said.